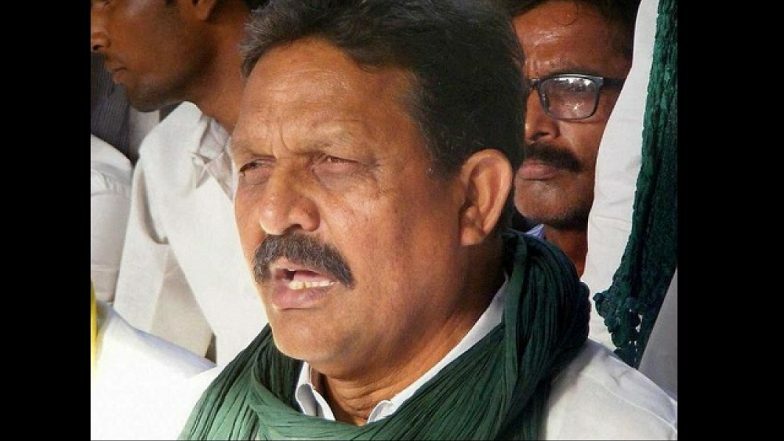 Lucknow, April 14: The Bahujan Samaj Party (BSP) on Sunday announced Afzal Ansari, the brother of jailed UP don Mukhtar Ansari, as the party candidate from Ghazipur constituency for the upcoming Lok Sabha elections 2019. The 66-year-old Afzal is the general secretary of Quami Ekta Dal, the outfit floated by Ansari brothers after their ouster from BSP in 2010. Afzal is a former Lok Sabha MP, having represented the Ghazipur seat on BSP ticket between 2004-09. In 2009, however, he was defeated by Samajwadi Party's Radhey Mohan Singh. Jailed BSP MLA Mukhtar Ansari Sent to Mohali Police Remand in Extortion Case. Afzal's younger brother Mukhtar, a five-time sitting MLA from the Mau assembly seat, has been reeling behind the bars since 2005. Among the charges levelled against him include murder and kidnapping. He is also an accused in the assassination case of former BJP MLA Krishnanand Rai. In 2010, the Ansaris were expelled by the BSP, on criminal grounds. Mukhtar had subsequently floated the Quami Ekta Dal, and re-emerged victorious in the 2012 assembly polls. In 2017, the Ansari brothers made their way back into the Mayawati-led party fold ahead of the assembly elections. The Ansari, according to pollsters, have a cumulative impact in nearly 20 assembly segments of Uttar Pradesh, spread across the districts of Ghazipur, Mau, Azamgarh, Ballia, and Varanasi. Apart from Afzal, the BSP has named 15 more candidates today, including : Chandrabhadra Singh from Sultanpur, Ashok Kumar Tripathi from Pratapgarh, Ramshiromani Varma from Shrawasti and Aftab Alam and Domariyganj.